Blogs aren’t very user-friendly for the new reader, so I thought it might be helpful to provide a little overview and some links to posts for new readers to start with. We live in a world that is finite. While there are huge amounts of oil, gas, coal, and minerals (such as uranium, gold, silver, copper, and lithium), we tend to extract the easiest to obtain, highest quality resources first. Eventually, we find it is more and more expensive to extract additional quantities of these items. Aquifers that are slow to replenish become more and more depleted. Top soil tends to erode faster than it is replaced. Pollution tends to be a problem too, with the most obvious example being carbon dioxide added to air and water. Economists have set up their economic models as if we would never reach limits. In fact, we seem to be reaching limits now, especially in the area of oil supply. World oil production has been approximately flat for six years now (since the beginning of 2005), even as producers have strained to raise production. OPEC claims to have a huge amount of spare capacity, but there is little evidence that this is really the case. They also claim to have very high oil reserves, but the reserves have never been audited, and are believed by many to be seriously overstated. There is great confusion regarding what happens when we reach limits in oil supply. People expect that if oil starts hitting limits, the symptoms will be high prices and shortages. In fact, the symptoms as often as not seem to be recession and an inability of would-be purchasers to afford the goods that are being produced with the high priced oil. This at times looks like an over-supply of oil–the opposite of what people expect. The issue is not a lack of oil, but a lack of cheap, affordable oil. If oil prices could rise high enough (and people’s pay checks could rise to accommodate this increase in price), there would likely not be a problem–we could just extract more higher priced oil. The fact that things seem to work in this manner helps solve the mystery regarding how there could be a huge amount of oil still in the ground, but oil supply still not be growing. Research suggests that once oil prices reach a high enough level (estimated by Steven Balogh to be $85 barrel in 2009 $), high oil prices start sending the economy into recession. Eventually, recessionary forces overcome the price rise, and oil prices drop. In time, demand rises again, and oil prices rise again, until the higher price once more leads to recession. This up and down pattern leads to an oscillation of oil prices, never raising prices high enough to really increase production. This failure of oil to reach very high prices also means that “renewables” do not become competitive either. As noted above, world oil production has been approximately level since the beginning of 2005. It seems to me that peak oil problems started about the time that oil supply first stopped rising, and prices started rising instead. Oil prices began rising as early as 2003, and in 2004, the Federal Reserve started raising target interest rates in response to higher oil and food prices. Eventually, higher oil prices and higher interest rates in response to the higher oil prices helped prick the housing bubble. Thus, the debt defaults and recessionary problems we have been experiencing in the past few years seem to be very much related to limits in oil supply. A chart I made some time ago. It seems to me that our problems started approximately when oil supply stopped increasing, represented by the departure of the blue line from the green line. I am not convinced the decline in oil production will follow the pattern shown in the graph. This is just one idea. We don’t know precisely when oil supply will start declining, but, in a sense, it doesn’t matter. Having oil supply that doesn’t increase is already a problem, because countries like China and India and oil exporting nations are taking more and more of the available oil supply, leaving less and less for developed nations like the United States. Going forward, I expect that the we will see significant debt defaults and more recession. Liebig’s Law of the Minimum (saying in effect, that if we lose an essential input, then a whole process will stop) is likely to mean that oil supply shortfalls are likely to have much wider influences than their magnitude would suggest. One area that is vulnerable is our financial system. It operates much better during periods of economic growth (because it is easier to repay debt with interest), and a reduction in oil supply is likely to result in economic decline. If there are serious financial problems, international trade is likely also to be adversely affected. Eventually, I expect that collapse is likely. The timing is not certain, but because of Liebig’s Law of the Minimum and the very connected nature of our systems today (oil, electricity, food, financial, international trade, Internet, medicine, etc. ), it seems to me that this collapse could take place in as little as 20 years. We cannot of course know with certainty, but it seems to me that we should be at least looking at this possibility, and planning accordingly. I have tagged a number of posts as Introductory Posts. These can be found by clicking the “Introductory Post” tag at the top of the right sidebar, or by clicking Introductory Post here. I might point out Our Finite World: Is this a Problem. I wrote this back in early 2007, outlining some of my basic views. My views have changed very little. You will note that even back then, I was talking about the likely outcome of peak oil being recession and problems with the financial system. 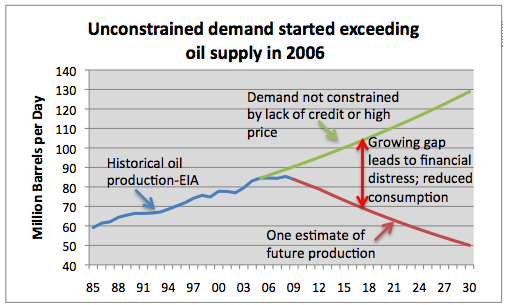 With respect to oil, one post giving some background with respect to our supply problem is Peak Oil Overview – June 2007. Another related post is Oil Production is Reaching its Limit: The Basics of What This Means. A very popular post with respect to alternatives has been What are our alternatives, if fossil fuels are a problem? A post showing the relative energy supply from different types of fuels over time is Our Energy Supply: Some Basics. What happens when energy resources deplete? One financial post that is on both blogs that should perhaps be mentioned is Delusions of Finance. I correctly predicted many of the problems that took place in 2008, at the beginning of 2008. This is a post explaining what I saw that others did not. With respect to planning for the future, Oil and the Economy: Why it is important to figure our approximately where we are headed is a good post to start with. A post which looks at the connection between oil consumption and employment is Part 1 of The Oil-Employment Link Part 1 and Part 2. Part 2 looks at how this might play out, and what policies might be appropriate. It is on the scary side, and might not be for new readers. A post giving an idea which may be a partial solution is What we can Learn from Gift Economies. Also, check out the posts listed on my listing of some of my posts from The Oil Drum.